I’ve mostly been posting page previews for MI, but we’re overdue for an animal dump so I might put one up on Patreon in a few days. We’ve got another update here and one more on TM this week to round out the 12x updates for March, thank you all so much again for your readership and support! Crabs are essentially ocean spiders. And so we finally learn the name of our alien friend. And it’s interesting that Mike is concerned about living when he was ready to commit suicide in the beginning, though he is still making some life-threatening decisions such as potentially drowning trying to reach the LEVi. I think Mike’s main concern that he has the ability to make that decision on his own. His psychosis seems to revolve around perceived messages trying to control him (“do you want to keep trying?”), and he flat-out told Bex that being in control of his own life was the only important thing. He set out to die on his own terms, and that decision was taken away from him. 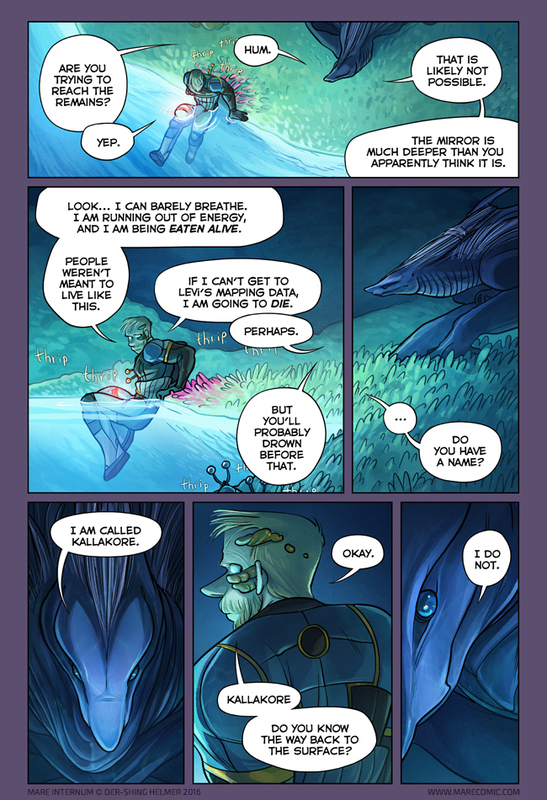 Now, if he dives down to LEVi, realizes he’s not going to make it, and decides not to try… then I think he’ll be really pissed off when Armsh- Kallakore rescues him somehow. Yeah, also Mike has a pretty solid track record of making extremely poor decisions, in the comic at least. If he wasn’t already fired, I’d fire him!! It’s important to remember that emotion plays a large role in depression. Mike’s recent experiences have shifted his mental state away from sadness and the pain has caused his survival instinct to kick in. Ever since Mike fell down the hole he’s been riding a combination of pain, adrenaline, and endorphin’s (both from the wounds and the environmental stimulus). He didn’t like his previous environment but now that he’s in a new more hostile one the experience has given him a new appreciation for his old life. When I was little I fell into a shrub full of baby cane spiders. She died like she lived; covered in spiders. You should come to Australia. Then you can live like we live: covered in spiders. Only if he still had his PLSS or thigh-friend. Did she just confuse mirror and pool/pond? Also, she’s not being honest about something. She knew Mike was expecting to do more than look at a broken Levi from a distance. Kallakore Armshark has a good poker face… Probably comes from not emoting the same way we do. kore – maiden. could be referring to ancient Greek statues of maidens and very quick search pulls it up as another name for Persephone. now we need a kako someone. Be interesting to know if Kallakore named themselves after encountering LEVi or before. Perhaps their name in Martian translates to “beautiful maiden” so they opted for the Greek version when speaking to Mike. Huh, in my language “Kalla kårar” roughly means a shudder caused by a gust of wind (or poltergeist). Ominous foreshadowing? Ps: If the thripping was a english dialect I imagine them as either very polite, russian socialists or incredibly rude scotts. lol… oh no… I hadn’t considered that the thrips were actually hurled insults. If so, he’s been mouthing off for pages. I’m relieved from the last comic. Kallakore seemed to be telling him that something bad would come from asking questions. Really great and creepy moments: 1) He asked for it, and 2) questioning things is a bad idea. I’ve had a bumpy ride with each page. Things seem like they could go way dark but then the next page jerks them back. Ah, haha, no, Kalla was referencing this earlier conversation. Although generally I would agree that they do not come off as 100% friendly all of the time. I can only imagine how fun it would be to watch those grass thingies create a pink wave as mike walks through. Also, Kallakore calling the lake a mirror is really interesting. I still don’t know if they actually know english or if the symbiotes in mike allow him to understand the martian. If Kallakore actually learnt english through LEVi, I’ll assume it means that they somehow retrieved the definition information from the robot and used it to learn. I can’t picture LEVi confusing the lake with a mirror and teaching the martian the wrong words, right? AIs are supposed to be precise, right? Or maybe you’ve been reading about Artificial Neural Networks, Der-Shing? Or maybe Kallakore uses the lake as a mirror, so that’s what she calls it. She called the cave her dwelling, but doesn’t seem to have furnishings in the traditional sense. She has to have some way to get that updo of hers looking right. THE MIRROR IS A METAPHOR FOR… um… DEEP STUFF. BECAUSE IT’S DEEP! 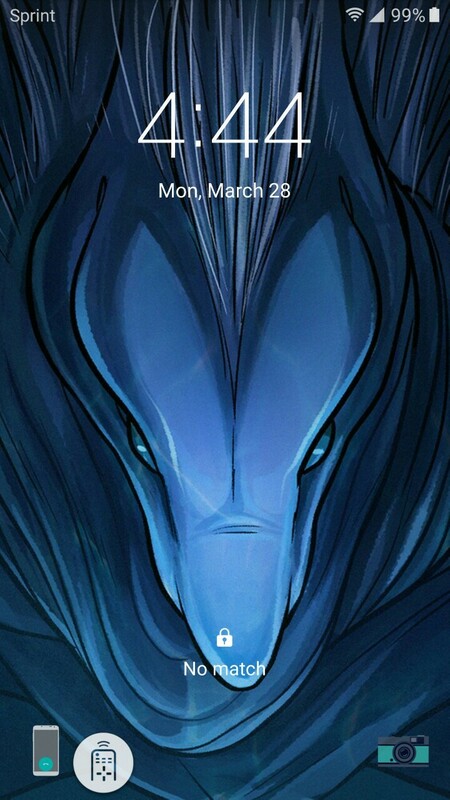 Can I use the bonus art close-up of Kallakore as my phone background? Kallakore is always going to be Armshark in my heart. Hmm I dont think leading another alien species to the surface is going to be a good idea. Or at least it never worked out in human literature. But who knows! Maybe it will work out this time! Kallakore may be equally concerned about humans finding the mare, too. We don’t have the greatest history when it comes to contact to new cultures. Also… there’s never just one of anything. Where are all the other armsharks? Has Mike encountered another misfit in exile, or is the place crawling with them and big K here drew the short straw? Man, his leg does NOT look good. I’m sure getting the open wound nice and soggy will work wonders. There are probably entire phyla of parasites he hasn’t encountered yet! So many new friends to meet! And so many internal and external passengers of his own that he’s introducing to them! Who will win in the end? I wonder if it’s considered rude to drown in somebody’s mirror. I could know where the highest point accessible by walking is, but there is no way there’d know a way to the surface itself. If there was, the atmosphere in the cavern would have vented, followed by any water and everything down there would have died. Seen that way, any sentient down there probably really hopes the hole the 2 humans fell in was plugged by tons and tons of falling rocks, else it’s gonna bode really bad for them in the long run. He’s got the same problem now, too, so I’m curious what he plans to do at the surface even if he could get to it. If the path to the surface is narrow and convoluted, and the atmosphere is being actively replenished by organisms down there, then it could work. He was going to examine them using the water of the Mare as a mirror but he was interrupted. By Kallikore. Hah, and that’s probably why she just now called it a mirror, that’s how she first saw him using the water, so for all she knows that’s what humans *do* with water. On the other hand, Mike’s a 1g critter operating in a 1/3g environment. His endurance and strength, even while weakened by parasites, is probably better than Kallikore is guessing, even taking that into account. If Mike is a strong swimmer to begin with, it *might* be doable. Just. Also thighfriend could come out and start whipping around like a propeller. Coincidentally, in an ancient dialect of Martian, old and forgotten, the name “Kal Lak Ore” means “Shark with Big Arms”. That would be like me naming my kid “Pinkish Bipedal Stick,” which is a rad name. You might be on to something. Other than cold shivers and pretty ladies, Kallakore also immediately made me think of a re-garbled form of ‘karakol’, which is a somewhat out of fashion Dutch word for an edible whelk/escargot. And a ‘kalle’ is a hag in one of our dialects. Pfrt. Very interesting name, that’s for sure. Guys, we’re forgetting something. Sure, it’d be normal to call a pool of water “mirror” on Earth, but this is *bioluminescent* water– it doesn’t WORK as a mirror! I’m curious, has it been addressed about the thing growing on michael’s face? Did I miss a page? They first appeared here and have done nothing but get fatty for the past howevermany pages. Although you should already know about them, CAVE MONSTER!! No idea why, but I find the cluster of crabs just so ootsie cutesie adorabibbles. Odd, since the cluster of harvestmen made my skin crawl. Kallakore! You lying sack of Armshark! You do know how to get to the surface! You just want to keep Micheal for yourself so you can play with your food before you eat him! Bah! The truly creepy spiders of the ocean are the ‘sea spiders’, aka the pycnogonids, whose anatomy looks all wrong and awful the more you learn about ‘typical’ arthropod anatomy. And those heads, ughhhh. Oh, soldier crabs! Those are really hard to catch =| As a child I would chase armies of them across the beach until they all burrowed away.